Which Is The Best London Film? M@ Which Is The Best London Film? Here's your chance to vote for your favourite London-set film of all time...and then see it screened at the Museum of London. From zombie attacks to transvestite nuns, from clichéd gangsters to flying nannies. Tube-travelling werewolves, pratfalling Beatles and an escapee brontosaurus. London has seen it all. Spurred on by our recent poll to find the best London novel we're now on the search for the greatest London movie of all time. Will you go for a big Cockney knees-up such as Oliver! or Mary Poppins? Perhaps a more modern effort like Notting Hill or Lock, Stock... Or maybe you'd prefer a cult classic such as Passport to Pimlico or Blowup? To get you thinking, here's a Wiki list of over 100. Now, here's the exciting bit. The Museum of London have offered to screen the TOP FIVE films, as voted for by you. The number 1 film will be shown at the opening weekend of the Museum of London’s brand new Galleries of Modern London on 30 May. 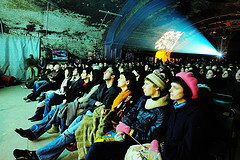 The remaining movies will be shown from August to November as part of their ongoing programme of London-themed film screenings . - If you really can't narrow it down to one film, you are allowed to vote for more than one as long as you do so in the same tweet or comment (i.e. you're not allowed to vote, see which way the wind is blowing, then vote again). - Nominations do not have to be exclusively set in London, but must feature the city prominently. - We'll try and screen the top 5, but we may reject winners if there's a good reason (e.g. you CAN vote for 'The Horny Harlots of Hampstead Heath' and get all your friends to vote for it too, but we're not going to screen it because (a) you're clearly gaming the system and (b) we just made that film up). - Votes close at midday (UK time) on Monday 26 April 2010. We'll reveal winners soon thereafter. Image by Joe Lee in the Londonist Flickr pool.